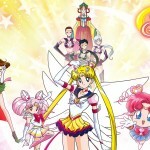 The two latest episodes of Sailor Moon Sailor Stars are now available on Hulu and Neon Alley. This week we get parts 4 and 5 of the 6 parts mini series that starts off this season. We have the Sailor Guardians split up into unlikely pairings as they are left to make due with what they have and fight Queen Nehelenia. 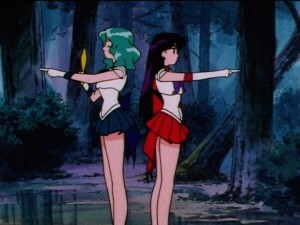 This gives us interesting explorations of all of the Sailor Guardians. Next week this arc will wrap up and we will also see the first of the Three Light and the Sailor Starlights Sailor Star Fighter, Sailor Star Healer and Sailor Star Maker. 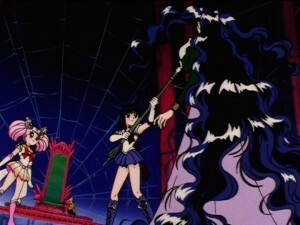 Next week we will wrap up this Nehelenia story with a real high quality final episode. 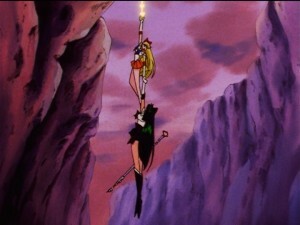 After that we are introduced to the Sailor Starlights at last! 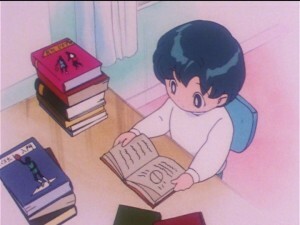 This entry was posted in Sailor Moon Anime (1992) and tagged Chibiusa, Eternal Sailor Moon, Hulu, Nehelenia, Sailor Jupiter, Sailor Mars, Sailor Mercury, Sailor Moon, Sailor Moon Sailor Stars, Sailor Moon Sailor Stars episode 170, Sailor Moon Sailor Stars episode 171, Sailor Neptune, Sailor Pluto, Sailor Saturn, Sailor Uranus, Sailor Venus, Tuxedo Mask by Adam. Bookmark the permalink. 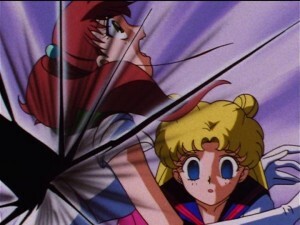 Next week, it’ll be good riddance to Sailor Mini Moon, because she was trying to take Darien away from Serena. Yeah, that was a close call. 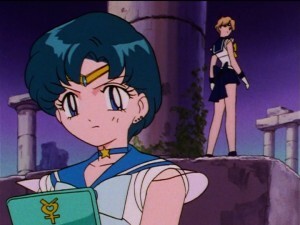 Usagi almost lost her boyfriend to a child whose very existence would be undone if she ever got what she seemed to want in Mamoru. You realize she was brainwashed at the time by Wiseman right? I feel like the Uranus and Mercury running scene is being misinterpreted. Viz’s translation “You were always matching my pace” is, I think, best interpreted as Neptune pushing herself to match Uranus, never complaining. Uranus just finally realizes this as Mercury pushes herself to keep up and Uranus adjusts herself. 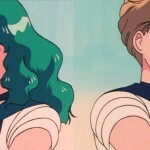 Sailor Uranus’ only connection with her element wind is that she seems to move like it, so Neptune being a faster runner seems off; however, most people make this interpretation, so maybe I am incorrect. 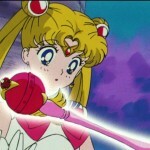 I’ll feel sad that Chibiusa will be appearing in anymore episodes after that. I meant not appearing anymore. My bad. I gotta say. I love the reminders of the new episodes coming out but your summaries of them always come across as overwhelmingly negative? Do you even actually enjoy it anymore? Yes I love the show I just find my comments always focus on the negative aspects. Personally I find your comments more humorous than negative but not everyone likes all the same seasons.